Well, this was the first day riding without Bill. 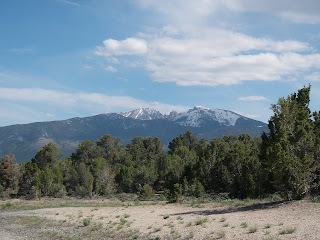 He decided to go in the car with Pete, Susan and Jack to explore The Great Basin National Park. We will miss him and his own special brand of humor. We were able to ride unencumbered again as we would all be reunited in Baker, NV. We rode against a stiff headwind until we began the ascent of Conners Pass when the wind turned to help us over the top. At the bottom of the descent we stopped at Majors Junction where we had a beer and saw a Basque condo (sheepherder's wagon). We then turned north through Spring Valley with a great roaring tailwind. We turned southeast to climb Sacramento Pass, our last climb in Nevada. At the top of the pass, Wheeler Peak came into view. We had a quick descent towards Baker with a tailwind until Dave got a flat tire. 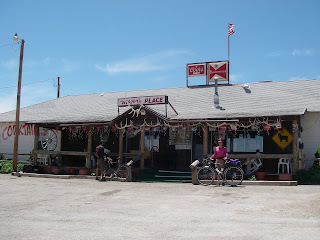 Soom we peddled into town and the Whispering Elms Motel where Jack quickly made friends with the parents of the owner. We were only 6 miles from Utah!